The anaphase-promoting complex (APC) is a ubiquitin-protein ligase required for the completion of mitosis in all eukaryotes. Recent mechanistic studies reveal how this remarkable enzyme combines specificity in substrate binding with flexibility in ubiquitin transfer, thereby allowing the modification of multiple lysines on the substrate as well as specific lysines on ubiquitin itself. The function of a ubiquitin-protein ligase, as its name implies, is to catalyze the ligation of the small protein ubiquitin to other proteins. Ubiquitin attachment occurs primarily at lysine residues, and in many cases the reaction is repeated at several lysines on the same protein and on ubiquitin itself, resulting in decoration of the target protein with multiple polyubiquitin chains, which send the protein to the proteasome for destruction or alter other aspects of protein function [1, 2]. Protein ubiquitination is a versatile and effective mechanism for controlling protein behavior, and has been adapted for diverse purposes by many regulatory systems in the eukaryotic cell. There is enormous complexity in the mechanisms that allow ubiquitin-protein ligases to recognize and repeatedly modify specific substrate proteins. Our purpose here is to illustrate these mechanisms in the case of an unusually large and complex ubiquitin-protein ligase called the anaphase-promoting complex or cyclosome (APC), which promotes the proteasomal destruction of key mitotic regulators in all eukaryotic cells (for reviews, see [3–6]; Figure 1). The APC, like other ubiquitin-protein ligases or E3s, promotes the transfer of ubiquitin to a target protein from another protein called a ubiquitin-conjugating enzyme or E2 (Figure 2a). The APC can therefore be viewed as a platform with specific binding sites for two substrates: the E2-ubiquitin conjugate and the target protein, which are positioned by the APC to allow the ε-amino group of a target lysine to attack the thioester bond that links the carboxyl terminus of ubiquitin to the active-site cysteine of the E2 (Figure 2b). The major biological function of the APC is to initiate chromosome segregation in mitosis. In metaphase, before APC activation, the duplicated chromosomes, or sister chromatids, are aligned at the center of the mitotic spindle. The APC promotes the ubiquitination and proteasomal destruction of securin, thereby unleashing a protease, separase, that cleaves cohesin proteins holding the sister chromatids together. The chromatids separate and are then pulled apart by the mitotic spindle in anaphase. The APC also triggers destruction of cyclins, the activating subunits of the cyclin-dependent kinases (Cdks). As a result, Cdk activity drops in anaphase. 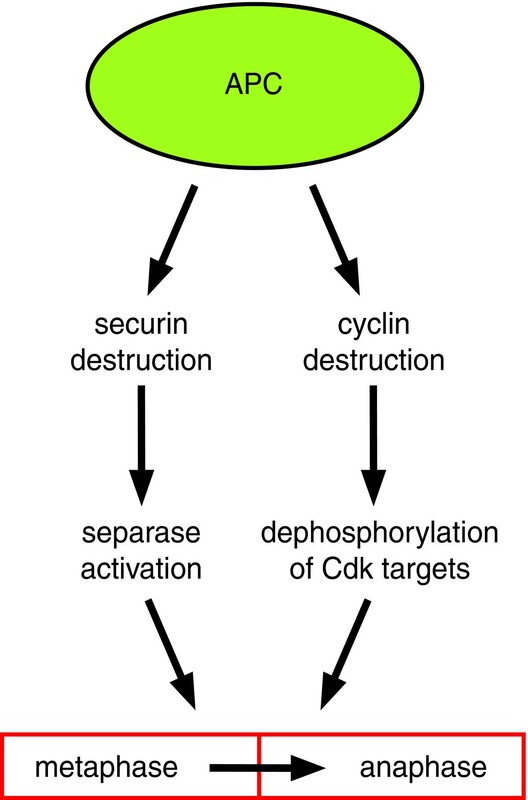 The resulting dephosphorylation of Cdk substrates is required for normal anaphase spindle function and for the completion of mitosis. The APC has numerous additional substrates, not shown here, that contribute to the control of late mitotic events and govern entry into the following G1. Ubiquitination occurs by a three-enzyme cascade. (a) Ubiquitin (Ub, yellow) is first activated by an E1, or ubiquitin-activating protein (purple square), which couples ATP hydrolysis to the formation of a thioester bond between the active-site cysteine of the E1 and the carboxyl terminus of ubiquitin. The E1 then transfers the activated ubiquitin to the active-site cysteine of an E2, or ubiquitin-conjugating enzyme (blue). Finally, the E3, or ubiquitin-protein ligase (green), facilitates the transfer of the ubiquitin from the E2 to a lysine on the target protein (substrate, magenta). In the case of the APC and many other E3s, this final step is repeated several times with the same substrate, resulting in ubiquitination of multiple lysines. In addition, specific lysines on ubiquitin itself can be modified, resulting in the assembly of polyubiquitin chains. (b) The APC is a member of the RING-domain family of E3s. These proteins facilitate the final step in ubiquitination by positioning the E2-ubiquitin conjugate next to the substrate, allowing the ε-amino group of a lysine on the substrate to nucleophilically attack the E2-ubiquitin thioester bond, resulting in direct transfer of ubiquitin as shown here. Members of the other major family of E3 proteins, called the HECT-domain E3s, employ an indirect, two-step mechanism (not shown here): ubiquitin is first transferred from the E2 to an active-site cysteine in the E3, after which a lysine in the substrate attacks the E3-ubiquitin thioester bond. The APC must bind substrate proteins with high specificity to ensure that only the appropriate targets are destroyed. In addition, the APC and/or its substrates must be flexible enough to allow the transfer of ubiquitin to multiple lysines on the target protein and to specific lysines on ubiquitin itself (Figure 2a). We will describe the basis for this balance of specificity and flexibility by focusing on two key issues: substrate binding and the catalysis of ubiquitin transfer. These features of APC mechanism are likely to have important implications for ubiquitin-protein ligases in general. 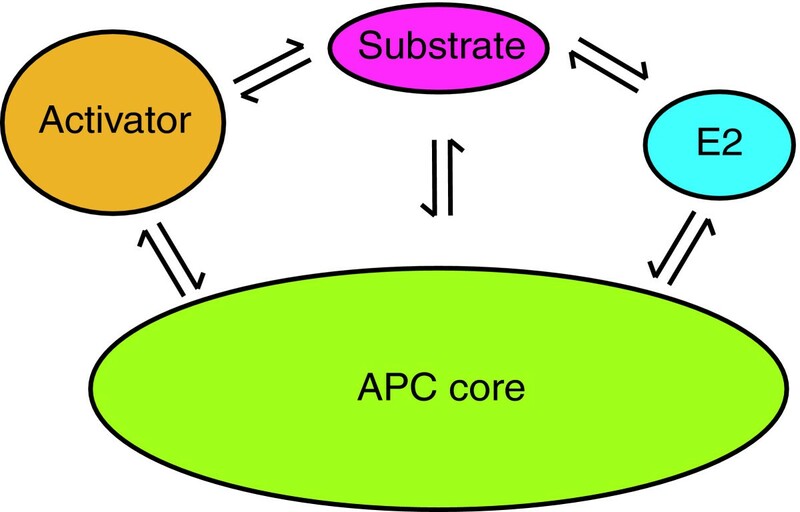 Protein ubiquitination by the APC requires the cooperation of four protein components: the APC core, the activator subunit, E2 and substrate (Figure 3). Activators, E2s and substrates all bind reversibly to the APC core with varying affinities, and interact with each other as well. To understand the contribution of each of these components to the ubiquitination reaction, it is helpful to first summarize their basic features. The four major protein components in an APC reaction. Catalysis depends on cooperative interactions among the APC core, activator, substrate and E2. The APC is an approximately 1 MDa, tightly associated complex of 11 to 13 subunits that are generally well conserved in eukaryotes (Figure 4; Table 1). The APC is a cullin-RING-type ubiquitin-protein ligase , in which the Apc2 and Apc11 subunits contain the cullin and RING domains, respectively. As in other cullin-RING ligases, the RING domain of Apc11 interacts directly with the E2, and the cullin domain of Apc2 binds Apc11 and probably provides an extended scaffold that connects these two subunits to the rest of the enzyme. The APC core contains multiple subcomplexes. The budding yeast APC core is an approximately 1 MDa complex of 13 subunits (Table 1), including the nine key subunits shown here. One subcomplex (dark green) contains the cullin subunit Apc2 and the RING-domain protein Apc11, which recruits E2s. Another subcomplex (light green) contains the three TPR-containing subunits, Cdc27, Cdc23 and Cdc16, as well as two subunits, Apc4 and Apc5, that help connect them to the rest of the APC via Apc1. The TPR-containing subunits provide binding sites for the activator (Cdh1 or Cdc20), which contains at least two APC-interaction motifs, the Ile-Arg (IR) motif and the C-box, as well as a large WD40 repeat sequence that is likely to form a propeller-like binding site for substrate. Dashes indicate that no homologous subunit has been identified in that species. Most core subunits are not yet identified in Drosophila melanogaster. Motifs in APC subunits include tetratricopeptide repeats (TPRs) and WD40 repeats, both of which form domains that are typically involved in protein-protein interactions. Modified from . The analysis of APC purified from yeast strains lacking individual subunits has led to the identification of APC subcomplexes (Figure 4) . One contains Apc2 and Apc11, as well as a third subunit, Doc1. Doc1 contains a β-barrel structure known as a Doc domain, which in other proteins is involved in binding to small ligands, and this subunit may contribute to substrate binding, as discussed later. The other APC subcomplex contains three large subunits (Cdc27, Cdc16 and Cdc23 in yeast) that carry ten or more copies of a 34-residue sequence motif called a tetratricopeptide repeat (TPR). These subunits seem to associate sequentially with the APC, such that the association of Cdc27 depends on Cdc16, and the association of Cdc16 depends on Cdc23 . Stoichiometry calculations suggest that the TPR subunits are present in two copies on the APC [9, 10]. TPRs generally form protein-binding grooves, and thus the multiple TPR subunits are likely to provide a large array of interaction surfaces on the APC core. The two APC subcomplexes are held together by the largest APC subunit, Apc1 (Figure 4). Apc4 and Apc5 help connect Apc1 to the base of the TPR subcomplex, Cdc23. The nonessential subunits Cdc26 and Swm1 (not shown in the figure) help stabilize the association of the TPR subunits with the rest of the APC [11, 12]. Cdc26 promotes APC integrity by forming a complex with the TPR grooves of Cdc16 . The functions of other APC subunits remain unclear. Several electron microscopic (EM) analyses have provided a glimpse of the size and shape of the APC [9, 10, 14–16]. At a resolution of around 30 Å, the yeast APC seems to form a triangular particle, and the localization of individual subunits by antibody labeling is roughly consistent with the architecture determined from subcomplex studies [10, 16]. In the highest-resolution EM structure, the TPR subunits are localized to an 'arc lamp' structure, and Apc2 is found in an adjacent 'platform' region where E2s are likely to bind . Despite its large size, the APC core has little activity in the absence of one of its activator proteins, Cdc20 or Cdh1 (a third activator, Ama1, is expressed solely in meiosis and will not be discussed here ). Cdc20 associates with the APC in early mitosis, leading to the destruction of targets that control the onset of anaphase. Cdc20 binding to the APC is promoted by phosphorylation of multiple APC subunits [18–23]. Later in mitosis, Cdc20 is replaced by Cdh1, which maintains activity through the following G1. The association of Cdh1 with the APC depends on Cdh1 dephosphorylation [20, 24, 25]. Activator proteins participate in substrate recognition by the APC. The carboxy-terminal regions of Cdc20 and Cdh1 contain a WD40 domain that is thought to form a propeller-like binding platform that binds APC substrates [26–29]. It is likely that sequence variations in the WD40 domains of Cdc20 and Cdh1 result in different substrate specificities. These differences in specificity provide a mechanism for timing the destruction of different APC targets in mitosis: Cdc20 targets a small number of key substrates for destruction at metaphase, whereas Cdh1 possesses a broader specificity, targeting these proteins and many more in late mitosis and G1 [30, 31]. Activators also contain at least two sequence motifs, the Ile-Arg (IR) motif and C-box, that are required for activator binding to the APC core. The IR motif consists of the two residues at the carboxyl terminus of the activator, and the C-box is an eight-residue motif near the amino terminus [29, 32, 33]. Activator binding to the APC is at least partly mediated by the TPR subunits (Figure 4): Cdh1 binds directly to Cdc27 in vitro [26, 32], and specific residues in the protein-interaction grooves formed by the TPRs in Cdc27 and Cdc23 are required for the binding of both Cdh1 and Cdc20 . The activator IR motif binds to the TPRs of Cdc27, and an additional unidentified activator region seems to bind the TPRs of Cdc23 . The C-box binding site remains unknown, but one possibility is the Apc2 subunit, as removal of Apc2 from the APC reduces activator binding . Together, these multiple interactions generate very high-affinity binding of activator to the APC core, and it is likely that the activator remains bound during multiple substrate-binding events . Recent EM analyses suggest that the activator is found between the TPR arc lamp and Apc2, in an ideal position to present substrates to attack incoming E2-ubiquitin conjugates . Whereas both the E2 and the target protein are chemically altered during ubiquitination, for clarity we use the term 'substrate' to refer to the ubiquitinated target and not the E2. The two essential substrates of the APC are securin and the mitotic cyclins (Figure 1) . The degradation of securin triggers sister-chromatid separation, and the degradation of the mitotic cyclins is required for the completion of mitosis. The APC, particularly when bound to Cdh1, also ubiquitinates numerous other proteins involved in various aspects of mitotic exit . Substrates bind specifically to the APC-activator complex through degradation sequences, the best understood of which are the D-box (RXXLXXXN) and KEN-box (KEN) [36, 37]. Although D- and KEN-box sequences are required for the ubiquitination of many substrates by the APC, they are often not sufficient, suggesting that substrates contain additional unidentified degradation sequences [36, 37]. Numerous APC substrates contain non-canonical degradation sequences that lack any clear sequence similarities [38–45]. It is likely that most, if not all, APC substrates contain multiple degradation sequences and might therefore be capable of multivalent interactions with the APC-activator complex. Degradation sequences and ubiquitinated lysines are often found in substrate regions that are likely to be disordered. For example, the globular Cdk-binding domain of cyclins is generally preceded by a disordered amino-terminal region that contains the critical D- and KEN-box sequences, along with numerous lysines. Securin is also likely to possess a disordered amino-terminal APC-recognition region adjacent to a carboxy-terminal functional domain. The separation of degradation and functional domains might prevent the degradation signal from interfering with the normal function of the protein, and thus might facilitate the evolution of regulatory degradation. As unfolded sequences at the amino or carboxyl termini of proteins are required for their efficient unfolding and translocation into the proteasome pore for degradation [46, 47], these unfolded regions may be a hallmark of all degradation targets. E2s share a conserved core domain of approximately 150 amino acids, including the central cysteine residue at which ubiquitin is attached; some E2s also contain amino- or carboxy-terminal extensions that lend specificity to their functions. E2s are charged with ubiquitin by the ubiquitin-activating enzyme E1 (Figure 2a). As E2s use the same binding interface to interact with both the E1 and the E3, E2s must dissociate from the E3 to be recharged with ubiquitin . The rate of E2 turnover is very fast: during in vitro ubiquitination experiments, the APC can add as many as ten ubiquitins to a substrate within seconds (MR-B and MEM, unpublished results). Ubiquitin-protein ligases such as the APC catalyze two distinct reactions: the ligation of ubiquitins to different substrate lysines (termed multiple monoubiquitination) and the transfer of ubiquitins to specific lysines on previously attached ubiquitins, leading to the formation of ubiquitin chains (termed polyubiquitination). Lysine specificity is determined primarily by the E2. In yeast, for example, Ubc4 promotes addition of ubiquitins to substrate lysines, whereas Ubc1 catalyzes ubiquitination of lysine 48 (K48) of a previously attached ubiquitin, leading to K48-linked chains that are recognized by the proteasome . The different preferences of these E2s allow them to collaborate in vivo, such that Ubc4 attaches the initial ubiquitins to substrate lysines and Ubc1 extends these ubiquitins into K48-linked chains. In vertebrates, UbcH5, like its yeast ortholog Ubc4, tends to generate nonspecific linkages to substrate lysines [50, 51], whereas E2-25K, like yeast Ubc1, generates K48-linked chains [49, 52]. UbcH10 allows the APC to make K11-linked chains . We now examine how the components of the APC reaction work together to catalyze the varied ubiquitination activities of the APC. Activators clearly contribute to the recognition of specific substrates for ubiquitination by the APC, but there is evidence that substrates also bind to the APC core: a peptide containing repeated D-boxes binds directly to the APC in the absence of activators . 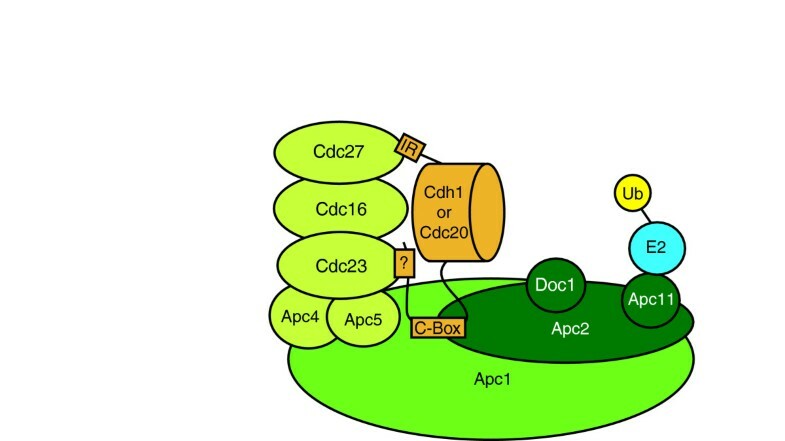 The location of the D-box receptor is not known, but one possibility is the APC subunit Doc1. Doc1 enhances substrate binding to the APC-activator complex [33, 34], thereby increasing substrate residence time and increasing the number of ubiquitins that are attached in a single substrate-binding event . The enhanced substrate affinity provided by Doc1 is dependent on the substrate D-box . Notably, Doc1 does not promote substrate binding by stimulating binding of the activator subunit. The concentration of activator required for half-maximal APC stimulation is unaffected by the removal of Doc1 . In addition, steady-state activator binding and the rate of activator dissociation from the APC are unaffected by mutations in Doc1 that are known to reduce substrate binding . Thus, Doc1 seems to promote activator-independent substrate binding to the core APC. Several models of substrate recognition by the APC have been proposed to take into account both activator and APC core binding sites . One possibility is a multivalent mechanism, where substrates are shared between substrate receptors on both the activator and APC. Multivalent substrate binding is supported by the observation that substrate enhances the affinity of activator for the APC, through a mechanism that depends on Doc1 [34, 57]. The simplest explanation for these results is that a multivalent substrate binds simultaneously to both activator and APC, although it is not possible to rule out more complex mechanisms such as substrate-induced conformational changes in the activator. A multivalent substrate-binding model is attractive for several reasons. Multiple low-affinity interactions would explain why individual interactions between substrates and the APC have been so difficult to detect, and allow high-affinity substrate binding to the APC-activator complex despite low-affinity individual interactions. Multivalency might also allow greater specificity in substrate recognition by requiring two or more separate binding interactions for efficient substrate recognition. After substrate binding, ubiquitin transfer requires the nucleophilic attack of the E2-ubiquitin thioester bond by the ε-amino group of a substrate lysine, leading to the formation of an isopeptide bond between the carboxyl terminus of ubiquitin and the substrate lysine by way of an oxyanion intermediate (Figure 5). This reaction depends on the deprotonation of the attacking amide group, as well as stabilization of the negatively charged oxyanion intermediate [1, 58, 59]. Reaction mechanism underlying protein ubiquitination by the APC and other RING-domain ubiquitin ligases. (a) The E3 positions the substrate and E2-ubiquitin conjugate in close proximity. (b) Deprotonation of the ε-amino group of a lysine on the substrate promotes nucleophilic attack of the thioester bond between the ubiquitin carboxyl terminus and the E2 active-site cysteine. (c) The initial product of nucleophilic attack is an oxyanion intermediate. (d) Completion of the reaction results in an isopeptide bond between the ubiquitin carboxyl terminus and the substrate lysine. The catalytic residues that promote ubiquitin transfer reside in the active site of the E2 itself. Biochemical studies of Ubc9, which conjugates the ubiquitin-like protein SUMO, have identified residues conserved in most E2s that enhance deprotonation of the substrate lysine - not by abstracting a proton from the lysine but by creating a local microenvironment of reduced lysine pK . In addition, a conserved asparagine in the E2 might provide a positive charge that stabilizes the oxyanion intermediate . Although this residue is positioned far from the E2 active site in structures of unconjugated E2s, it rotates towards the active-site cysteine upon ubiquitin or SUMO conjugation, or E3 binding . It therefore appears that the ubiquitin-protein ligase does not catalyze the chemical step directly, but instead facilitates ubiquitination by positioning the substrate and E2 in a productive orientation. Because the catalytic residues for ubiquitin transfer are located within the E2, high concentrations of substrate lysines drive a low rate of ubiquitin transfer from an E2-ubiquitin conjugate, even in the absence of an E3 [62, 63] (MR-B and DOM, unpublished results). This activity can be detected with a diubiquitin synthesis assay, which measures transfer of ubiquitin from the E2 to monomeric ubiquitin in solution. At least in some cases (including the E3s SCF and APC), the rate of ubiquitin transfer by E2s is stimulated by interaction with a RING E3 [62, 64, 65]. Because the ubiquitin substrate in these experiments is free in solution and is therefore not positioned by the E3, stimulation by the E3 may be due to an activating conformational change induced in the E2 by the RING domain. Activator proteins might enhance the rate of ubiquitin transfer by the APC through a mechanism that is distinct from their role in substrate binding. Studies of the unusual APC substrate Nek2A suggest that activators induce an activating conformational change in the APC. Nek2A contains a carboxy-terminal dipeptide motif (MR) that is similar to the IR motif at the carboxyl terminus of activators, and it uses this motif to bind the APC in the absence of activator. However, bound Nek2A is not ubiquitinated unless activator is also added . Ubiquitination of Nek2A is even stimulated by an amino-terminal fragment of Cdc20 that lacks the substrate-binding WD40 domain . The amino-terminal activator region, which includes the C-box, might therefore promote an activating change in APC structure that is independent of the activator's substrate-recruiting function. Insights into the role of activator-induced conformational changes in the APC might be found in recent studies of the ubiquitin-protein ligase, SCF. Modification of the cullin subunit of SCF with the ubiquitin-like protein Nedd8 enhances catalytic rate , probably as a result of a conformational change that reduces the distance between the RING domain (where the E2 binds) and the substrate-binding site . While there is no evidence that the APC is group of neddylated, it is possible that activator binding to the APC results in a similar conformational change in the cullin subunit Apc2, thereby enhancing the rate of ubiquitination. Ubiquitination by the APC is processive; that is, multiple ubiquitins are added during a single substrate-binding event. Processivity is readily observed in ubiquitination assays with the E2 Ubc4, in which multiubiquitinated substrates appear in the first seconds of a ubiquitination reaction despite the presence of a large excess of unmodified substrate. In these Ubc4-dependent reactions, the APC does not display higher activity with pre-ubiquitinated substrates, and thus would not preferentially re-bind them. Thus, substrates must remain bound to the APC for a sufficient time to allow multiple E2s to bind, transfer ubiquitin, and dissociate. The residence time of a substrate on the APC is determined by its dissociation rate. This rate varies among different substrates, so that different substrates acquire a different number of ubiquitins in a single binding event. 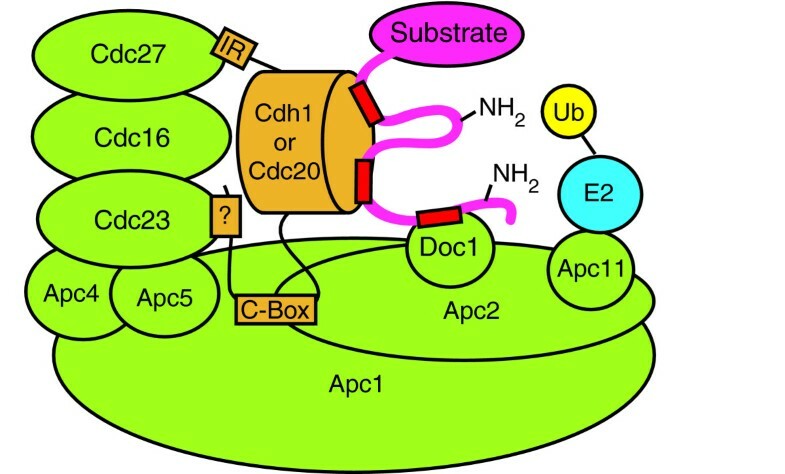 Substrate dissociation rate, and thus the degree of processivity, is influenced by the activator subunit: for example, Cdc20 may have a higher affinity for securin than Cdh1, as this substrate is ubiquitinated with higher processivity by APC-Cdc20 than it is by APC-Cdh1 . An increase in the number of ubiquitins added to a substrate may increase the likelihood of substrate recognition by the proteasome in the face of competing deubiquitinating activities in the cell. Thus, substrates that are ubiquitinated more processively by the APC may have an enhanced degradation rate in vivo . However, this variable degradation efficiency could be achieved by varying substrate affinities whether the reaction is processive or not, and so it is not clear what advantage a processive ubiquitination mechanism might confer. The lysine to which ubiquitin is attached determines the efficiency of substrate recognition by the proteasome. Polyubiquitin chains linked by K48 of ubiquitin are generally considered to be the ideal proteasome-targeting signal . However, multiple monoubiquitinations and small nonspecific chains might also be sufficient for proteasomal targeting in some cases [49, 50], and recent evidence suggests that linkages at K11 or indeed any lysine other than K63 can be recognized by the proteasome [51, 71]. In yeast, the APC (with the E2 Ubc1) generates polyubiquitin chains linked by K48; in human cells, the APC (with UbcH10) produces K11-linked chains . As mentioned earlier, E2s have different lysine preferences. In yeast, for example, Ubc4 is specialized for promoting ubiquitin transfer to lysines on a large number of substrates, while Ubc1 is specialized to promote the formation of K48-linked polyubiquitin. The molecular basis of this lysine specificity is not yet understood, but presumably depends on residues surrounding the active-site cysteine of the E2, which are expected to position the attacking lysine [62, 72]. Although Ubc1 has a carboxy-terminal extension containing a ubiquitin-binding domain, this domain is not required for the K48 specificity of the Ubc1 catalytic domain ; instead, this specificity is provided by specific residues near the active-site cysteine in the catalytic domain (MR-B and DOM, unpublished results). The ability to modify many different lysines and accommodate growing ubiquitin chains implies some degree of flexibility in the APC active site. As discussed earlier, many APC substrates are predicted to contain unstructured amino-terminal sequences, which would allow variable positioning of attacking lysines and might also allow a growing substrate to loop out of the active site. Multivalent substrate binding might allow the APC to better position these unstructured regions for attack. Furthermore, the APC core may also provide a source of flexibility. EM structural analysis suggests that the angle between the 'arc lamp' and the 'platform' might vary to accommodate substrates of various sizes or ubiquitin chain length . In addition, neddylation of some cullin-RING ligases results in more flexible tethering of the RING domain to the associated cullin subunit, providing flexibility in the positioning of the RING-E2 complex . Perhaps similar conformational changes occur in the APC upon activator binding, as mentioned earlier. This leaves us with our current view of protein ubiquitination by the APC (Figure 6). First, an activator binds with very high affinity to the APC core, possibly inducing a conformational change that results in more productive positioning of the binding sites for the E2 and substrate. A substrate then binds to the APC-activator complex using multiple degradation sequences, often found in disordered regions, that interact with sites on both the activator and APC core, possibly via the Doc1 subunit. The E2-ubiquitin conjugate then binds to the APC, positioning the E2 near the substrate and perhaps resulting in a conformational change in the E2 that stimulates its activity. Residues near the E2 active site then promote catalysis. Several E2s may cycle on and off the APC before one is successfully attacked by a substrate lysine; in yeast, the initial successful attack is likely to be on a ubiquitin conjugated to Ubc4. 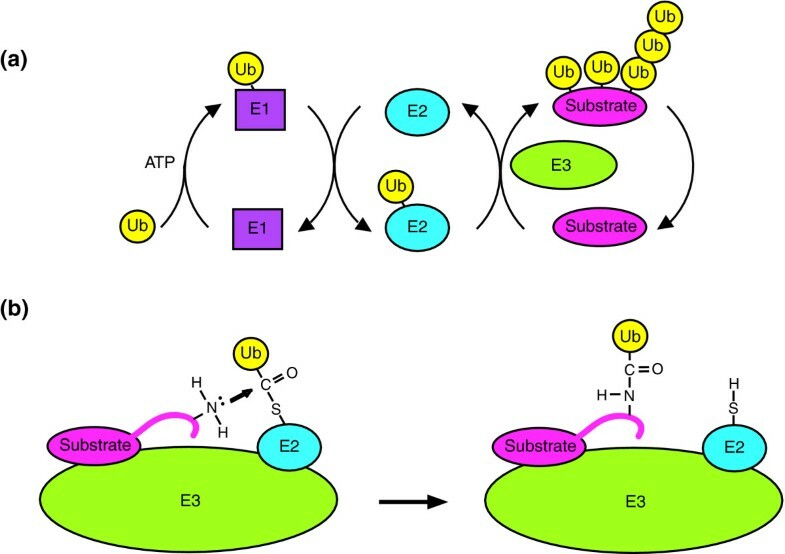 After this initial ubiquitin is transferred to the substrate and the E2 dissociates, additional E2s will then bind and be attacked successfully by lysines on the substrate or by specific lysines on ubiquitin itself, as determined by residues near the active site of the E2. Flexibility in the substrate and APC helps accommodate the modification of many different lysines and the formation of long ubiquitin chains. Substrate residence time, and thus the number of ubiquitins added in a single substrate-binding event, is determined by substrate dissociation rate. A speculative model of protein ubiquitination by the APC. Substrate (magenta) is likely to bind multivalently to both activator and the APC using degradation sequences (red rectangles) in disordered substrate regions. The APC positions substrates so that multiple lysine side chains can effectively attack the E2-ubiquitin bond. Residues near the E2 active site promote catalysis, which is stimulated upon binding to the APC. Flexibility in both the substrate and APC may help accommodate the modification of many lysines and the formation of long polyubiquitin chains. Many features of this model remain mysterious. Substrate recognition is still poorly understood: while the roles of some APC subunits are becoming clear, a direct binding site for substrates on the APC core has not been identified, and the amino acid sequences that target substrates to the APC-activator complex are still poorly defined. Activators clearly play a central role in APC function, but it is not clear how these proteins alter enzymatic activity: they may do more to activate the APC than just participate in substrate binding, and we need to know more about the conformational changes, if any, that activators induce in the APC core. Finally, it is unclear how E2s are stimulated upon binding to the RING domain, and the structural determinants of E2 lysine specificity remain to be identified. Clearly, an understanding of these and many other problems will be found in a combination of detailed structural studies and quantitative analyses of protein-protein interactions and enzyme kinetics.